As adults we must lead by example, and show our children how important it is to live a healthy and positive life. What better way than to push yourself through a day of ­fitness training. 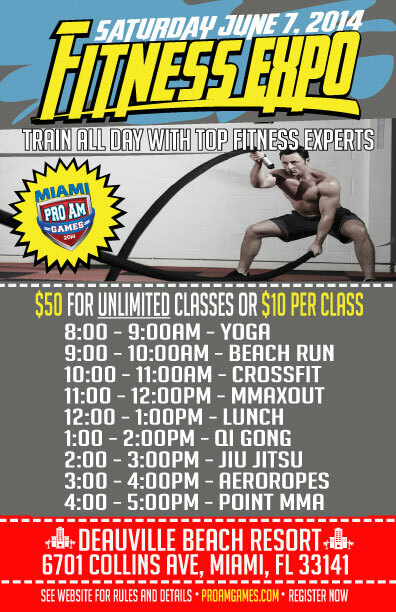 Take an individual class or two, or sign up for the full day PRO AM FITNESS STAR pass and take all of the classes. FITNESS STARS that complete the whole day receive an awesome swag bag with gift and prizes. Starting with Yoga, the morning session also includes a Beach Run, a Cross­fit class and a MMAXOUT class. After a lunch break, the afternoon session offers a Qi Gong lesson, a Jiu Jitsu Self Defense class, Aeroropes Battle Rope Training, and a high energy Point MMA class. Take the FITNESS STAR challenge and become Better, Faster and Stronger!! !